Chinery-Hesse, M. 2013. The role of the AU and Africa-EU Partnership in dealing with the peace and security situation in Africa. GREAT Insights, Volume 2, Issue 6. September 2013. Maastricht: ECDPM. Effective as the European Union – African Union Partnership has proven, time has come to modify the current top-down approach and co-opt local constituencies into the process for even greater impact. For those of us who had the privilege of being part of the Midwifery Team, which superintended the birth of the deepening cooperation between the European Union and Africa in the mid 1970’s, it has been intriguing to witness how the relationship has evolved over time. From the original focus on largely trade and economic cooperation, we have a relationship that currently is more and more absorbed as well by issues of security and conflict resolution. This change has been driven by the realisation that peace and security are a sine qua non for sustainable development; and there is no gainsaying that Africa has had more than its fair share of conflicts. The nature and intensity of many of the conflicts have learnt themselves better to resolution through sub-regional and regional interventions because it is evident that the security of each African country is inseparably linked to that of other countries in the sub- regions, and indeed to the continent as a whole. As a matter of fact, some conflicts in Africa have not been confined to the borders of individual nation states, with serious regional implications. That is why the Continental Organisation has been bold to move from the original principle of non-interference, to that of non-indifference in affairs of Member States, especially in cases of human tragedies such as genocide, crimes against humanity, or massive violations of human rights in Member Countries. The principal structure established by the African Union (AU) in collaboration with the Regional Economic Communities (RECS) in 2000 is the African Peace and Security Architecture (APSA), with the responsibility to deal with prevention, management and resolution of conflicts in Africa, and to give space for Africa to take control of resolving its own crises in response to changing global realities. The expansion of the remit has also demanded the creation of partnerships with those who can assist with discharge of the onerous responsibilities entailed. This has informed the increased collaboration between the AU and the European Union (EU) in areas of tackling security, democratic, humanitarian and human rights situations on the Continent. As Africa has sought to strengthen its regional security mechanisms in order to stem conflicts and sustain the democratic culture that is now being embraced on the continent, the EU has extended assistance through a multi-dimensional approach encompassing political, institutional and financial aspects, through the Joint Africa-European Union Strategy. This comprehensive policy framework has peace, security, democratic governance and human rights as principal objectives. The main thrust of the Strategy has been enhancing dialogue on challenges to peace and security, mediating peace, directing APSA and funding AU-led peace support operations. The natural partner within the AU Commission for the collaboration has been the Peace and Security Council, the core organ of APSA. EU resources have been applied, through the African Peace Facility (APF) among other things in promotion of the agenda. As APSA has evolved with the creation of new mechanisms such as the Panel of the Wise and the Early Warning System, EU has contributed to support them for their optimal functioning. There is also EU commitment to provide support to the operational capability of the African Standby Force. It is gratifying that the recent joint consultative meeting between the AU and EC underlined the need for continued cooperation between the two parties to work towards achievement of the common goals of ensuring peace and security and promoting democratic governance, respect for human rights, the rule of law, protection of civilians and accountability for war crimes and crimes against humanity. How effective has the Partnership been? A core objective of the collaboration was to accelerate decision-making and coordination processes, and also to improve synergies built between the African Union Peace and Security Council and regional entities dealing with conflict prevention, management and resolution. There are many instances of success I can quote. I limit myself however to the recent creation of the Continental Pan-African Network of the Wise (PanWise); an outfit that brings together the AU Panel of the Wise and similar institutions from the RECs, as well as other institutions and individuals involved in mediation activities. PanWise provides a preliminary framework for the operationalisation of peacemaking on the Continent. It will meet regularly to discuss peacemaking initiatives and ensure coordinated approaches to preventive diplomacy, peacemaking and peacebuilding. The EU has been acknowledged as the source of major financial support for APSA. It is important that Africa in the shortest possible time shoulder greater responsibility in this regard, to demonstrate commitment to the peace imperative. It is welcome news therefore that at the last AU/EU Strategy Consultations, the AU undertook to deploy its efforts even more vigorously to mobilise resources especially from within the continent, but also from other international partners to better support ongoing peace initiatives in the continent, including support towards Africa-led peace efforts. Attention has to be drawn at the same time to the fact that, impressive as APSA and the array of mechanisms and instruments for promotion of peace can be judged to be, their approaches to interventions in times of crisis can be described as top-down. The inadequacies of these mechanisms are becoming increasingly glaring when one considers the challenges confronting the continental and regional organisations in places like Libya, Egypt, Mali, parts of Nigeria, and Guinea. These weaknesses are the more poignant when one accepts that more often than not conflicts on the continent reflect the weakness of African States. Unless the structural causes of the democratic and governance deficits at the level of countries are addressed, the spiral of conflicts will persist. It is imperative therefore that steps be taken to ensure that domestic political institutions are strengthened, as the first line of conflict prevention. The effectiveness of EU support for APSA would be considerably enhanced if the capacity of relevant national security apparatus of African States is simultaneously improved. The objective should be to strengthen institutions in Member States in order to inculcate a sustainable democratic culture for peace. It is also a fact that there is a nexus between governance, development and security. The lack of socio-economic development contributes substantially to insecurity and instability; but security and stability are a prerequisite to sustainable development. Conversely, sustainable development can only be nurtured in an enabling environment of responsive, open and participatory governance. At the same time, there is no doubt that government structures and processes tend to falter and atrophy in the constricting conditions of unattended poverty and the accompanying insecurity. In other words, the objectives of APSA risk being undermined if they have to operate in an environment marked with deep socio-economic and political systemic inadequacies. Given this interrelationship of governance, development and security, the challenges they present have to be confronted simultaneously as the most efficient preventive process against the conflicts in Africa. The structural sources of conflict include the unequal and unfair burden of poverty on different social and ethnic groups within the community, bad governance and the denial of human rights and the rule of law. They also include endemic corruption, a lack of probity and accountability in political and natural resource governance, exclusion or marginalisation of social and ethnic groups. These must be attended to. On the socio-economic front, there is a major youth crisis plaguing the continent, with many countries unable to adequately feed, educate and facilitate employment opportunities for their youth. Consequently, countries are confronted with unemployed and unemployable youth that constitute an endless festering pool of frustrated and willing potential foot soldiers from which warlords and other adventurers may recruit to pursue conflict agendas. Success can only come out of a holist and comprehensive strategy, which would take all these dimensions into account. What would it take to move forward? The existing APSA approaches themselves would need to be reassessed to modify the current top down thrust in favour of more bottom-up approaches to conflict prevention and peacebuilding. Local constituencies organised for the promotion of peace in communities would need to be more vigorously co-opted for this purpose as an essential link in the chain, and domestic allies of APSA. Their capacity building therefore deserves support. Additionally their local knowledge could enrich processes towards the building of national infrastructure for peace, dialogue and non-violence appropriate to the culture of each country. It should not be assumed that resources channeled to the AU by EU would filter down to the national level for the essential capacity building activities referred to above. Dedicated earmarked funds should be ring-fenced to this end. This might have implications for the modalities used by individual EU member states for assistance to African Countries. Better consultations and greater coherence should be encouraged among European Countries for maximum effectiveness. The EU has been a faithful partner of the AU in the fight against instability and conflict, which is commendable. Together, efforts should continue to be made by both parties to identify the best strategies for maximum impact of resources, in pursuit of the shared agendas and interests. 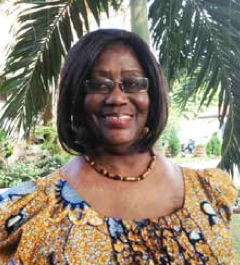 Dr. Mary Chinery-Hesse is a member of the African Union Panel of the Wise.